In community I see a lot of uncooperative or anxious children. A useful technique I use almost every day is the Hall technique in the placement of stainless steel crowns (SSCs) on primary molars. This was something that took a while to get good at; so here are my top 10 tips. In general, Es are easier to place SSCs on but sometimes you need to consider the same technique on Ds. 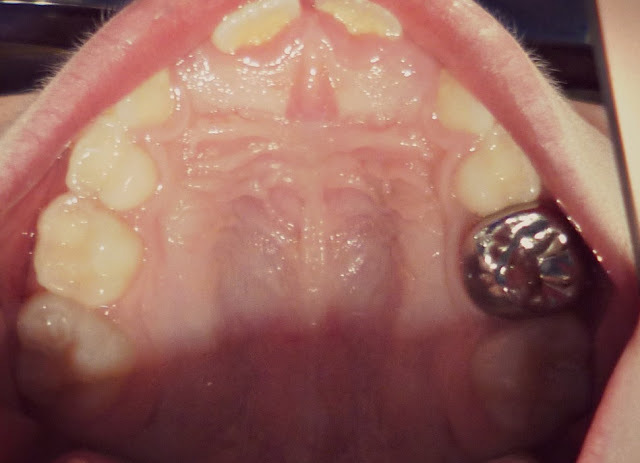 Small Ds can be quite tricky to place with a Hall technique (especially lower Ds) due to their buccal bulbosity. Placing seps can be a pain and children often find it uncomfortable as you sometimes need to use a lot of force to floss the sep into the interproximal space. The teeth can also ache afterwards while the separator does its work. I have seen children pick them out as they don't like the feeling of them (imagine something stuck between your teeth that you can't get out!). I have also seen seps that are left in for too long and then have sunken through the contact point into the gingivae. This can be very uncomfortable for the patient and getting them out can be so even more and can be very tricky in a child who is not very compliant. Always warn the parents of these risks and ensure if you are going to place seps, they are ideally not in for more than 1 week. I know a true Hall technique involves no prep or caries removal. Ideally, you would want to remove some caries even if this is just with a hand excavator and in some cases a quick slice through a contact point with a bur doesn't even require LA and is a quick way to ensure you can seat your crown. If you are going to prep, I tend to just remove the contact points and any buccal bulbosities. Be careful if you are prepping near a 6 to ensure you don't damage that tooth and in some children behaviour management can be challenging when using a handpiece. You won't hear dentists say that much. In the primary dentition, occlusion is changing all the time and children are very adaptable. Evidence also shows that within weeks, increases in OVD are very minor and it is thought this is due to intrusion of the opposing tooth (there is no evidence that this damages the successor). It can feel unnatural initially cementing in a crown where a child is clearly very jacked open but they adapt over time. Always warn the parents prior to cementing (and the child of course) and analgesics may be required to make it feel more comfortable initially. Although I've just said don't worry too much about the occlusion, avoid placing SSCs on opposing teeth at the same time. This is because the change in OVD can be quite significant and will be more uncomfortable for the patient. Don't be afraid, in most cases you need to press firmly to seat the crown. The main method I use is to ask the patient to bite together hard either on a cotton wool, tongue depressor or orthodontic band seater. In some cases however this may not be appropriate e.g. if there is no opposing tooth. The other trouble with that method is you need the child to comply to bite hard - many either only bite gently because of the feeling of tightness of the crown, or in younger children or those with learning difficulties they may not be able to follow your instructions fully. In those cases you will need to press down hard - the satisfaction when you hear the 'click' of the crown seating fully reassures you that the crown is seated fully (often the gingivae will blanch to show you it's seated slightly subgingivally, which provides an excellent seal). Most people only consider SSCs for primary molars, but they can be useful for 6s in the developing dentition. Obviously you will need different preformed crowns, but you need to use them slightly differently to primary SSCs (I wouldn't want to change the occlusion that much). On permanent molars which have been root treated in teenagers where you require cuspal coverage but you don't wish to do a conventional crown yet either for occlusal reasons or compliance issues. Getting that click as you seat and seeing blanching gingivae is the ideal, but sometimes it's not always possible to fully seat (for example if the child doesn't bite down fully). You are aiming to seal in any caries, so as long as the caries is sealed in that is acceptable. In my experience, if this does happen it's most likely to be an exposed palatal margin. However, I also find placing SSCs in more of preventive approach can be useful. For example, for children with high caries rates who have caries in the majority of their primary molars at quite a young age, I would consider crowning at least all the Es even if they don't all have caries in them yet. I have also placed crowns in some children with complex medical issues or learning difficulties where they suffer from lots of reflux or vomiting to protect from wear. When I first started doing SSCs I didn't appreciate how tight they can feel for children. I have had many a child be a bit teary after I place them because of that feeling of tightness (they get used to it quickly) and you need to learn to reassure both them and their parents. Again preparation is key so explain to them it will feel tight. The analogy I use all the time is trying on a new pair of shoes that are tight at first until you wear them in. Always advise the parents to give appropriate analgesia in some cases for 1-2 weeks until the child adapts. To read more about Hall crowns, there is a really good summary article in the most recent BDJ. Do you do SSCs? What tips do you have? Leave them in the comments section.